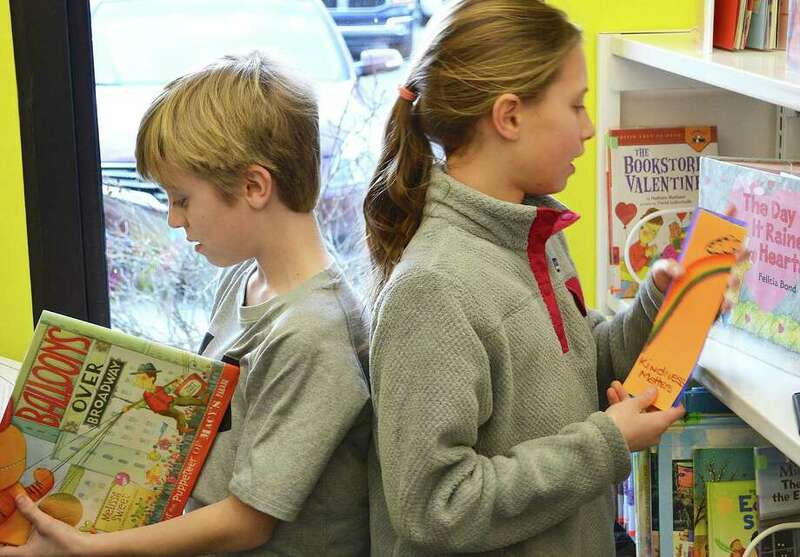 Meg Barnouw, 10, right, decides on a kindness bookmark for a particular volume at Fairfield Woods Branch Library, while Nicky Faustini, 11, takes a closer look at a selection. Kindness not only matters, it’s contagious. That’s the philosophy behind a grassroots group of Fairfield moms and students who believe random acts of kindness can play a role in helping to combat bullying. For a fourth year in a row, students from North Stratfield Elementary School last week brought hundreds of hand-crafted bookmarks to the Fairfield Woods Branch Library, which they placed in books as a pleasant surprise to unsuspecting readers. “There seems to be all of this talk about anti-bullying, so let’s try to use more proactive language,” said Veronica Mollica, who with the local Kindness Matters movement promotes positive attitudes and activities. She has even posted some suggestions and plans for others to make use of on a website, www.kindnessmatters.net. “We did it last year and I remember I walked out the door and just felt like I did a really nice thing,” he added. “It makes you feel good knowing you’re being kind to someone,” said Meg Barnous, 10.